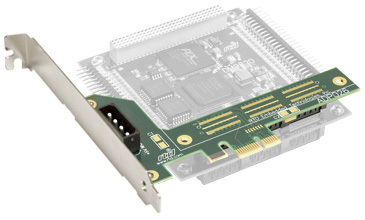 The PCIe x1 compatible PCI/104-Express bus adapter is an easy way to use one PCI/104-Express module in a PCIe bus system. 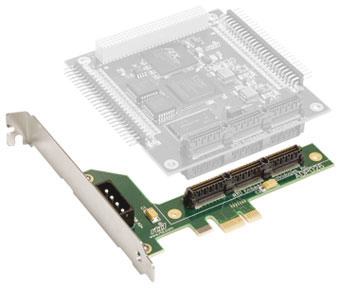 The PCIe x1 Adapter holds one PCI/104-Express module and connects the PCIe bus stacking connector to the PCIe bus edge card connector. This allows mixing of PCIe x1 and PCI/104-Express bus products for development, testing, or a final product. The PCIe x1 Adapter kit is provided with two stackthrough PCIe x1 Adapters so that PCI/104-Express modules may be stacked on either side.